Please note: Henna Lace is not actually henna, it is a temporary tattoo ink that can be used to re create henna like designs. 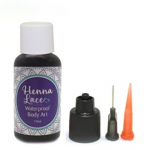 Unlike real henna, Henna Lace will not stain your skin, it only requires around 20 minutes to set and it can be removed easily with alcohol when needed. We have grouped Henna Lace with Henna products so its easy to find.